Aboard the Norwegian EPIC -- We were already a day and half at sea on Monday morning out in the Atlantic Ocean cruising towards our first port of call, St. Maarten, when the first scheduled event of the day was a screening of the Aisling Irish Center documentary When Mem’ry Brings Us Back: Irish Stories of Farewells and Stories of Immigration to America. Our Folk N Irish Cruise hostess Joanie Madden appears on the soundtrack. The Bliss Lounge filled with many folks who could have appeared in the documentary telling their own tales of leaving the Shamrock Shores for Americay, crossing the wide Atlantic for a new life and opportunity when Ireland provided very little hope of the same. Fast forward a half century, and almost 4,000 people would be onboard this ship and two others within a two week span out of Florida for the Caribbean enjoying more luxurious cruises filled with Irish music, dancing and fellowship that gave ample evidence of the good life awaiting them in North America. While a huge event is underway to draw folks to The Gathering in Ireland in 2013, it is just possible that many of the Irish and Irish Americans might prefer to stay on this side of the Atlantic and ply the waves listening to the music of a bygone Ireland that may or may not exist anymore. While that is food for thought, what really appeals to people entering the gangplanks of larger and larger floating cities featuring whole festivals of Irish music is the leisurely pace of seven days without having to plan more than where you will go for your next meal or entertainment choice. Upon the EPIC, where the Norwegian Cruise Line emphasizes free-style cruising, fixed meal times are not the norm and more variety is on offer beyond the standard buffet tables. The third largest cruise ship on the ocean, the EPIC provided a greater challenge for impresario Madden doing her second cruise with her Cherish the Ladies partners Mary Coogan, Mirella Murray, K.T. Boyle and Grainne Murphy. Over the seven days there were 66 Irish music or dance events to keep people entertained, including quite a few late night sessions that went on until the sun was rising on the horizon. The entertainment was top-notch as you would expect, and Madden has a knack for finding entertainers who not only can do their own shows, but intermingle with other performers to maximize the stage shows. Starting with her own troupe Cherish the Ladies, Madden augmented it with her Irish Homecoming Band Liz Carroll, Maura O’Connell and bohola (piano accordion whiz Jimmy Keane and singer/accompanist Pat Broaders), and the big Galway songman Don Stiffe with a voice as big as all outdoors. Each would perform their own sets throughout the week and join forces for big shows in the Manhattan and Spice H2O venues. The dancers for the crew were Cara Butler and hubby Jon Pilatzke, Donny Golden, John Jennings and Michael Boyle, all consummate performers. The Black Family re-united Mary and Frances with the two U.S. based brothers Michael and Shay. Mary’s daughter, singer Roisin O’Reilly, was onboard as well, capably accompanied by guitarist Bill Shanley who also did the honors for Maura O’Connell’s solo shows. It is a rare treat to see them perform all together these days, even though brother Martin was unable to attend due to illness in Ireland. They also excelled in the many singing sessions that were part of the late night craic every night. On fire all week on the top deck in the open air were the McLean Avenue Band headed by Padraig Allen from Westmeath and joined by Buddy Connolly, Tony Ryan and newcomer on the cruise Mickey Coleman from Tyrone, who was a huge hit on his own right. 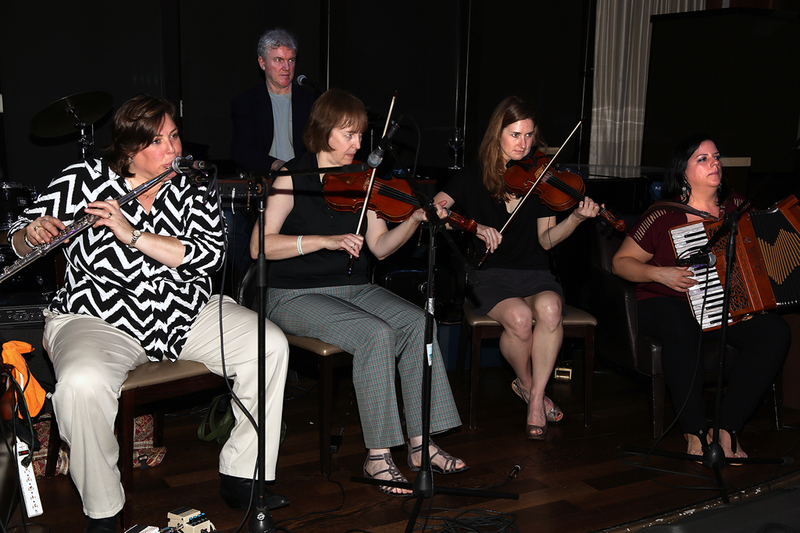 Fiddler John Reynolds was blazing working with that band as well as his wife’s Margie Mulvihill’s Pride of Moyvane Ceili Band with guests John Nolan and Erin Loughran. The Young Trad whizzes Dylan Foley and Dan Gurney kept the chunes flying along with Monsignor Charlie Coen all week and a latecomer, veteran fiddler Antoin Mac Gabhann from Meath (by way of Cavan) helped fan the flames as well. Once again the Madden cruise was a singer’s paradise this year, with singsongs every night until the wee hours. With fabulous singers like Don Stiffe, Tommy Sands, the Blacks, Mickey Coleman, Frank McCaffrey, T.R. Dallas, Maura O’Connell, Dermot Hegarty, Frank McKenna, Donie Carroll, Pat Broaders and the three harmonious voices of Guaranteed Irish in Bruce Foley, Paddy Folan and Jimmy Lamb from Pittsburgh, it was easy listening all night long in Cagney’s Pub. For the most part it was spontaneous like any good singing session, filled with some great talent from the audience like Noel Reid of Athlone by way of New Orleans, or Kevin Brooks from Manhattan or Margie Delany from Athenry or Sally Coyne from Connemara. But on the Thursday night Gabriel Donahue worked the room with aplomb like he has for years all over this country. He organized a mike and sound system to enhance the occasion and raise the intensity level above the usual barroom din. The Gabe-star introduced all and accompanied many as singer after singer strolled to the front rendering their familiar hits or party pieces without skipping a beat for two and half hours like nothing you have ever seen before. Admiration and respect flowed through the room like the spirits from the attentive staff amidst the kind of community that builds all week when people come from all over the world to celebrate their Irishness unabashedly. When Mary Black gave us “Song for Ireland” in that forum with the chorus being shared by all, the Atlantic Ocean never seemed so small or divisive. Neiden Loughran’s contribution “In My Father’s House” talked of the demise of the Rambling House, but maybe it has simply gone to sea. The heart of the Irish is in their music and songs, and with stalwarts like Madden traveling the world by land, sea and air the Irish folk tradition is alive and well. Long may it continue.